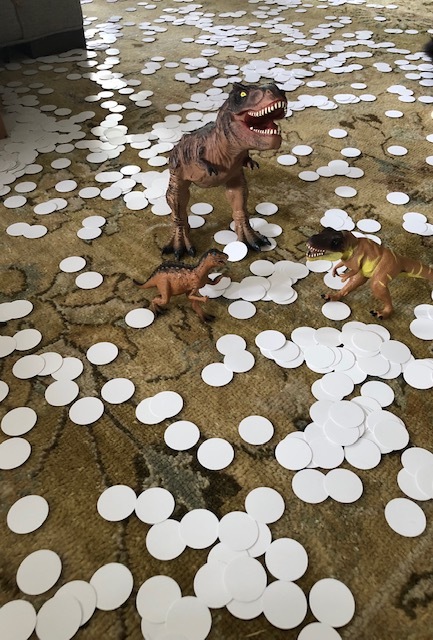 T-Rex and friends on a field of volcanic ash. There are folks here in Woodland Heights who, for whatever reason, just don’t live their lives online. the internet is simply not an important thing in their lives. Nonetheless, they are important to us as neighbors. That’s why we continue to print newsletters a few times a year, when it’s important to get critical information widely distributed. It’s also why we use things like door hangers, just recently distributed, to promote the Constable Patrol Program. A hat tip to the Home Tour committee for pointing out that strategy. The door hangers present a certain problem as well. When we take delivery they have been die cut to hang on the door, but there’s a paper circle that has to be popped out of every one. Since we print 2000 copies that’s 2000 little paper circles that might very possibly litter up the neighborhood. However, block captain coordinator Andrea Gorney doesn’t let that happen. She broke down the box, counting out how many are needed for each block. In the process she popped out all those dastardly circles! They would not have a chance to litter the ‘hood. Over the course of the past couple of quarters that WHCA board has concluded that the board members alone simply can't do everything that needs to be done. If we are ambitious in our goals, we need the help of volunteers to accelerate our progress. We joke that what we need are some Minion! One of the things I have learned is that the VP-Comms needs to more directly support the activities of the committees. While I've reached out, seeking submissions, I've not always been able to craft them myself. Nor do the committees necessarily have resources required to adequately promote or document their various activities. Writer - We would benefit tremendously from someone to help with some writing. We need to be more proactive about generating stories for the web site and newsletter. Also, to assist the committees in creating compelling copy for their various projects. Photographer - Words without pictures can be lifeless. We could surely use someone who would take photographs at WHCA events like the Home Tour or Lights-in-the-Heights. Between events there are opportunities to photograph the Yard-Of-The-Month or Creature Feature. I'm sure that we can dream up dozens of fun and interesting things to photograph in WH. If you are interested in either of these volunteer opportunities, please get in touch! You can email communications@woodland-heights.org. This item is excerpted from the February issue of the WHCA eNewsletter. It’s only fitting that we acknowledge the behind-the-scenes efforts of those help make Woodland Heights such a great community in which to live. Those of us who serve on the WHCA board are perhaps most visible, but there are dozens of other volunteers who bring critical skills, time and attention to enhancing the neighborhood. I'd like to take this opportunity to acknowledge the largely unseen efforts of Andrea Gorney. Andrea is the WH neighbor who has overseen our block captain program for the past two years. Andrea coordinates the ever-changing team of volunteers who ensure that our printed newsletters and door hangers actually make it to your door in a timely fashion. She's been integral to how the WHCA reaches out to neighbors who are not necessarily active online. And I am tremendously grateful for her assistance. P.S. - WHCA is an all-volunteer organization. If you would like to help us in our mission to “bring about civic betterment and social improvements in the Heights area of Houston…,” please get in touch. In January of this year I completed my second year on the WHCA Board of Directors. At the end of 2016, I was recruited into the post of VP of Communications, filling the void left by the departure of the very capable Mark Sternfels. Mark not only preceded me in this post, he has continued to provide assistance as needed. Last fall he stepped in to help the Lights in the Heights committee make various changes to the WHCA web site at a time when I was busy with preparing printed goods. He's consistently willing, helpful, skilled and patient. It’s only appropriate that we recognize the efforts of people like Mark, who help make WH a vibrant and exciting community. The WHCA general meeting on March 12th is the final meeting of our year. That meeting centers around electing a new Board of Directors. On April 1st that new board takes over for the 2019 - 20 year. To facilitate that election, the WHCA President is tasked with appointing a nominating committee who are charged with finding candidates to run for the various open directorships. According to the bylaws that committee must be two (2) current directors and three (3) homeowner members. So it is that we are seeking volunteers to sit on the nominating committee. To sit on this committee you must be a WHCA member and not yourself running for a directorship. If you are interested in volunteering please contact Harry McMahon at president@woodland-heights.org. The WHCA newsletter for November 2018 has been printed and is now finding its way to your door. Our cadre of volunteer block captains are busy distributing this last printed edition of the year, which includes everything you need to know about Lights in the Heights. Want to get a little ahead of thing ni planning for the big weekend? You can download a PDF copy right now. Come get the facts and ask your questions at Mayor Sylvester Turner's town hall meetings about the Rebuild Houston and Fire Union salary referendum elections on the November 6, 2018 ballot. A one-page fact sheet on the vote can be found on the District H website, along with a link to the Mayor's Town Hall PowerPoint presentation. As we pass the anniversary of Hurricane Harvey with a blissfully quiet week in WH, I'm pleased to announce that the next printed WHCA newsletter is on its way. Our squadron of volunteer block captains, under the direction of Andrea Gorney, begins distribution today. This issue highlights various facets of the planning for the 31st annual Lights in the Heights and related events. This year LITH events start in September, with a LITH Neighborhood Forum at the WHCA General Meeting on Sept 11th. Beyond LITH, this issue also includes an article about Bike Share Houston and Jay Francis' take on the chile con queso recipe from Felix Mexican Restaurant on Westheimer. While the printed version will be at your door shortly, you can download an electronic version right now by clicking on the image above. The Woodland Heights Civic Association has bi-monthly General Meetings. The upcoming meeting is scheduled for Tuesday, September 11, 2018 at 7:00 PM in the Hogg Middle School cafeteria. This meeting will have the added dimension of offering a Neighborhood Forum to discuss the plans for the 31st annual Lights in the Heights festival. The upcoming Meeting and Forum, like most of our General Meetings, is open to all who wish to attend, whether or not they are Members of the Association. The Association’s Board of Directors and related committee members will be on hand to entertain all discussion points as they pertain to the LITH festival. The goal is to provide a platform for all those wishing to express comments or concerns about the LITH events as outlined in this newsletter. We understand in such a diverse neighborhood as ours, perceptions and expectations can vary, but it is our hope this forum will foster a constructive dialogue amongst neighbors. The Board will listen to those varied opinions, learn from our neighbors and, if appropriate, act on comments or criticisms from the stakeholders in the neighborhood. Of course, the LITH Neighborhood Forum will be part of our regularly scheduled General Meeting and subject to the Association Bylaws. If you are curious about those Bylaws, they are all on the Association website at https://www.woodland-heights.org/bylaws/. To be heard you must attend. Please plan to attend. While summer is not officially upon us, school is out and the kids are looking for things to do. It's warm enough that we've already encountered a couple of lemonade stands. I confess that I'm drawn to a lemonade stand like a moth-to-a-flame. I'm always happy to part with a few dollars in return for lemony refreshment, and the hope that I've helped some young entrepreneur in-the-making. The trouble is that it's not easy to know when a new lemonade stand pops-up. They can be unpredictable. They can turn-up, run a while, then disappear quickly. Many folks don't even know that they were there. I'd like to help in this regard. If you're planning a lemonade stand, let us know. Send an email to communications@woodland-heights.org with the time and location. We'll quickly post it to the various WHCA channels, including our Facebook page, mailing list and Twitter account. Hopefully we can drive traffic to all the neighborhood lemonade stands. That way the kids have a great time, and see good return on their effort. As for the rest of you...be watching those channels for your opportunity to help our bright, young business folks get a good start. Think of it as a kind of citrus-powered Y-Combinator. It's been said that golf is "a good walk ruined." Wouldn't it be nice to turn that on it's head? Do some good by the simple act of taking a walk around our wonderful Woodland Heights Here's your chance! The WHCA Block Captain program is seeking volunteers to assist in the distribution of printed materials throughout the neighborhood. While typically this involves our printed newsletters, this week we're seeking help to distribute a one-page flyer about the Constable Patrol program. We expect this one-page document to be printed by Friday and likely available for pick-up and distribution over the weekend. Volunteers will be notified via email when the flyer is available for pick-up. If you are able to help distribute to the neighborhood, please sign up for your preferred blocks at the link below. Hello again - the latest WHCA newsletter is currently being distributed by our block captains. Normally, our February newsletter would be in email form, but this year is a little different. The return of the biannual Home Tour on the weekend of March 23-25 prompted a decision to print this edition, which is chock full of details about eight fabulous homes on this year's home tour, and how you can get to see them. This issue also includes an article by Matt Johnson about the status of the Neighborhood Traffic Management Program. As WHCA VP of Infrastructure, Matt has been the WHCA's liaison to the Public Works Department, who are responsible for the traffic calming program. While the printed version will be at your door shortly, you can download an electronic version right now by clicking on the image to the right. This weary editor would like to thank everyone who contributed to this issue. Registration for the Spring 2018 the youth baseball league for the neighborhood is open until Feb. 12, 2018. Cost for registration is $75.00 per player, with a discount for siblings residing in the same household. Late registration fee is $100.00. To determine the proper division for your child, a chart is available online at heightsnorhill.com. Mandatory skills assessments will take place on Feb. 16 and Feb. 17. Registration forms and details regarding league regulations are also available at heightsnorhill.com, as information on how to be a volunteer. Heights-Norhill Little League is operated by adult volunteers. Games take place at Stude Park. We need to find three WHCA members to serve on the nominating committee for the upcoming WHCA elections in March. If you would like to volunteer, please email me at president@woodland-heights.org. The task is simple - tell people about the upcoming election in March, understand and take nominations for WHCA Board positions, and monitor the March the voting on March 20 at the Annual General Meeting of the WCHA. There are five members; two from the WHCA Board (Tyson Greer and Carla Reed), and three non-Board members (these are the ones we are looking for). Only requirement is that you are a paid Homeowner member (owner of a residence within the association boundaries) of the WHCA. The Nominating Committee will be finalized by January 31, 2018 and nominations for the 2018-2019 WHCA Board will be open starting February 1st, 2018. 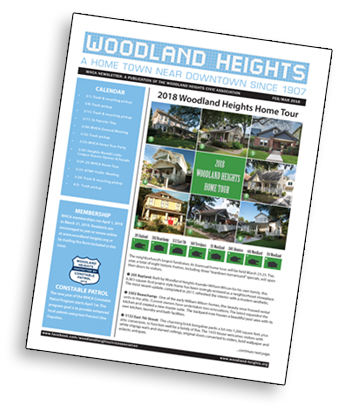 Want to learn more about the board and its officers - please take a look at the WHCA Bylaws on our website https://www.woodland-heights.org/bylaws/. In recent weeks there has been considerable online chatter resulting from the new federal tax plan. In particular, some neighbors have inquired about the idea of "prepaying" for property taxes for 2018. The following research summary was submitted by Rosie Walker, who is a former writer and communications manager at the Harris County Tax Office. Property taxes in Texas are paid in arrears, not in advance. January 31, 2018, is the due date for 2017 property taxes. Below is a summary of the process taken from websites of the State Comptroller and the Harris County Tax Office. A large part of the job of the Harris County Appraisal District (HCAD) is to estimate what your property is worth on January 1 each year. January first each year is referred to as the “snapshot date.” What a property is used for on January 1, market conditions on that date and who owns the property on that date determine whether the property is taxed, its value and who is responsible for paying the taxes. Upon completion of this work (protest hearings), HCAD is charged with providing each taxing jurisdiction (City of Houston, HISD, HCC, Port of Houston, Flood Control District, etc.) a list of taxable property within its boundaries. The Harris County Tax Office collects for most of the jurisdictions that tax property in Woodland Heights. You may verify your tax bill online at hctax.net/Property/TaxStatement. In August or September, the elected officials of each taxing unit should adopt tax rates for their operations and debt payments (i.e., budgetary items). Only then will we be able to know the exact dollar amount of property taxes we owe. Tax collection for 2018 property taxes will begin in the fourth quarter of 2018, with due date for 2018 property tax being January 31, 2019.